The familiar landmark of Belfast Castle, overlooks the city from a prominent site 400 feet above sea level on the slopes of Cave Hill. This magnificent sandstone building, recently restored by Belfast City Council’s Parks Department, has close associations with the city’s history. The first ‘Belfast Castle’ was built by the Normans in the late 12th century. On the same site a stone and timber castle was erected in 1611. The home of Sir Arthur Chichester, barron of Belfast, was burned down in 1708, leaving only street names (eg Castle Place) to mark the site. The Chichesters (later the Donegalls) lived in England as absentee landlords but came to live at Ormeau at the beginning of the nineteenth century. After re-marrying in 1862, the 3rd Marquis of Donegall, decided to build a new residence within the deer park on the slopes of Cave Hill. The architect firm Lanyon, Lynn and Lanyon was engaged with the junior partner John Lanyon being responsible for the plans of the castle. He followed the Scottish Baronial style, popularised some years earlier by the reconstruction of Balmoral Castle in 1853. The building was completed in 1870, having far exceeded the initial estimate cost of £11,000. The Donegall fortune had dwindled so drastically that the project was nearly left unfinished. The son-in-law of the Marquis, Lord Ashley, heir to the title, Earl of Shaftesbury, stepped in and paid for its completion. The 3rd Marquis died in 1884 and the 7th Earl of Shaftesbury the following year. Lord Ashley, and his wife Harriet Augusta, thus inherited the Shaftesbury title and the Donegall home. The two families are remembered in many Belfast street names eg Donegall Place, Square and Road and Shaftesbury Square. The Donegall coat of arms appears over the front door and on the north wall of the castle, while a section of the Shaftesbury crest appears on the exterior staircase. This unusual feature was not on the orginial plans but was added in 1894 by the 9th Earl of Shaftesbury as a present for his mother. The Italian style serpentine staircase connects the main reception rooms to the garden terrace. The Shaftesbury family were philanthropists, supporting various charities and hosting garden fetes within the castle ground. The 9th Earl became Lord Mayor in 1907 and Chancellor of Queen’s University the following year. The family presented the castle and estate to the City of Belfast in 1934. From the end of the 2nd World War until the 1970’s the castle became a popular venue for wedding receptions, dances and afternoon teas. In 1978 Belfast City Council instituted a major refurbishment programme that was to continue over a period of ten years at a cost of over two million pounds. The architect this time was the Hewitt and Haslam Partnership. The building was officially re-opened to the public on 11 November 1988.
satisfaction for you and your guests. • Red Carpet and complimentary glass of champagne for the bridal couple on arrival. • Changing Room for the bridal couple. • Matching menu and place cards. • White linen napkins and inserts of quality coloured napkins if required. • Choice of cake stands: - round, square, swan 2 & 3 tier. • Presentation silver cake knife. • Professional assistance in creating a menu to suit your needs. • Guests with particular dietary requirements can be catered for. • An excellent choice of wines to compliment your meal. All the function rooms have been named to commemorate historical figures associated with Belfast Castle over the years. On entering the building, the visitor passes an illuminated terrarium in the reception area that leads to the Shaftesbury Room. Here the original oak paneling and ceremonial fireplace create an historical atmosphere. Adjacent to the Shaftesbury Room is the Donegall Room. 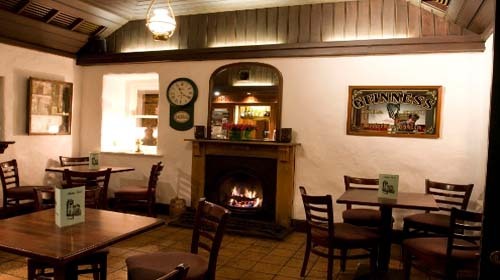 This is a large spacious, yet cosy room which includes a bar and is furnished in traditional lounge furniture. The Donegall room leads to the beautiful carved oak staircase with spacious lobbies at both ground and first floor level. The photo shows a typical round banquet table, set up for a function such as a wedding reception. 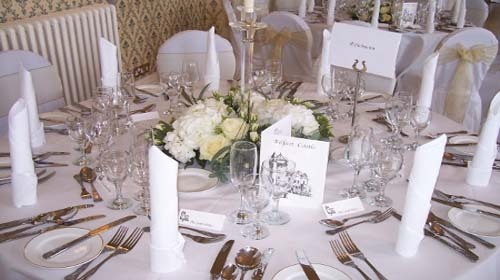 Tables are dressed in white linen and are capable of seating a maximum of 10 people. The main room, the Chichester Room with its polished maple floor, 18th century style wallpaper, chandeliers, and panoramic views, runs the full length of the building and is, an ideal setting for Wedding Receptions, conferences, dinners and other functions. On the first floor is the bridal changing room, the Ashley Room, the Fisherwick Room and also the Ben Madigan Room, which has beautiful views over Belfast Lough. Renowned for its superb wide ranging menu, using fresh local produce to create innovative and modern dishes it is served in the warm yet historic ambiance of the cellar. The Cellar Restaurant is open 7 days a week offering a wide variety of menus from morning coffee to full meals. The adjoining Haslam Room is a small, cosy function room available for hire. Cave Hill, its familiar outline visible from many parts of the city, has captivated generation after generation. It has become ingrained into Belfast’s social history and culture, and into the very lives of its people. Indeed the hill is one of the most celebrated landmarks of the city. Belfast Castle, sited on the lower slopes beneath Cave Hill, is one of Belfast’s most outstanding and historically significant biuldings. Find out about the people who once lived on Cave Hill, who built Belfast castle, and about the social ‘parties’ once held on the slopes below the caves. Discover how old Cave Hill is, how it got its name, and what rocks lie beneath the surface. Read the story of how Belfast Castle came to be built, of the families who lived there, and see how the rooms might have looked in the 1920s when the castle was a family home. Relive the ‘heydays’ of Bellevue Pleasure Gardens, the Floral Hall, and Bellevue Zoo. Experience the sights and sounds of the Cave Hill country Park, an amazing site so close to the city, yet retaining a wild and remote quality. Learn about some of the plants and animals that live within differing areas of the hill - woodland, meadows, heath, the cliff face and two nature reserves. The Centre is divided into four separate rooms. One room tells the story of people on the hill, from Stone Age up to current times; another looks at the natural setting, views both of and from the hill, geology and wildlife. 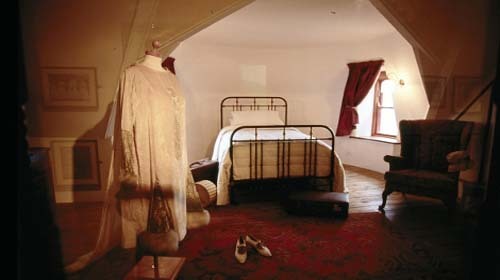 A compact audio visual room shows an 8 minute presentation entitled ‘Watching Over Belfast’, the story of Belfast Castle and Cave Hill, while the fourth room has been set up as a 1920s style bedroom where a bride-to-be prepares for her wedding. A collection of photographs illustrates the changing fashions in weddings at the castle since 1940s to the present day. The Cave Hill Visitors Centre is now open free of charge to all. 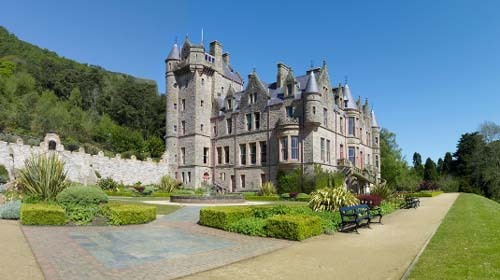 It is sited on the second floor of Belfast Castle and can be visited at any time between 9:00am and 10:00pm Monday to Saturday, and 9:00am to 6:00pm Sunday. • Choice of room layouts to suit your individual requirements. We can arrange for the hire of any other equipment from our local supplier. • Choice of syndicate/breakout rooms - these should be requested at the time of booking (if possible). • Private facilities also available for dining. • Photocopying and faxing are available for a small fee. Please ask at reception for further details. 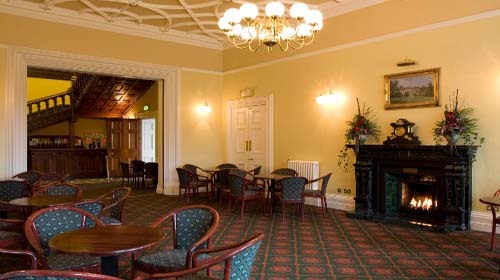 • Conferences/Meetings under 40 persons in Belfast Castle and under 20 in Malone House will be served in the restaurant. This will consist of a choice of 3 main courses, 3 desserts and Tea/Coffee. Delegates will be presented with the lunch menu at the mid morning Tea/Coffee break and asked to make their choice. Conferences exceeding these numbers will be served at pre-arranged Fork Buffet lunch. Malone House will have a Fork Buffet lunch served in another room. This will consist of a choice of 2 main courses, 2 sweet and Tea/Coffee. • If any of the coffee breaks are not required then the cost is £1.00 less, irrespective of which break. • Please indicate at the time of booking your specified times for Tea/Coffee and lunch breaks. Belfast Castle located on the slopes of the Cave Hill offering spectacular views over Belfast City. 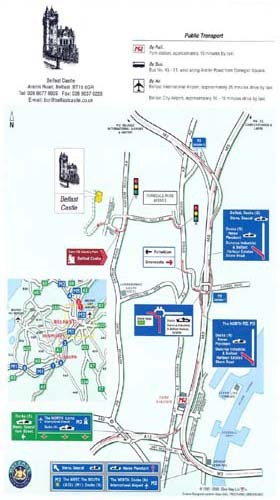 Belfast, and there are ample car parking facilities provided at the end of the main driveway near the building.